Innovator. Tyrant. Consummate showman. Passionate lover of women. After the death of King Louis XIII in 1643, the French crown went to his first-born son and heir, four-year old Louis XIV. In the extraordinary seventy-two years that followed, Louis le Grand - France's self-styled 'Sun King' - ruled France and its people, leaving his unique and permanent mark on history and shaping fashion, art, culture and architecture like none other before. 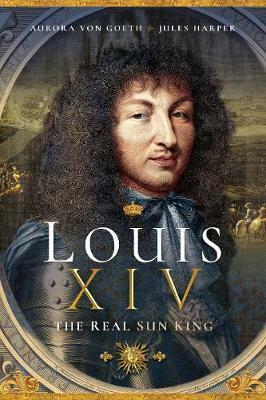 This frank and concise book gives the reader a personal glimpse into the Sun King's life and times as we follow his rise in power and influence: from a miraculous royal birth no one ever expected to the rise of king as absolute monarch, through the evolution of the glittering Ch teau de Versailles, scandals and poison, four wars and many more mistresses... right up to his final days. Absolute monarch. Appointed by God. This is Louis XIV, the man. We will uncover his glorious and not-so-glorious obsessions. His debilitating health issues. His drive and passions. And we will dispel some myths, plus reveal the people in his intimate circle working behind the scenes on the Louis propaganda machine to ensure his legacy stayed in the history books forever. This easy-to-read narrative is accompanied by a plethora of little-known artworks, so if you're a Louis XIV fan or student, or just eager to know more about France's most famous king, we invite you to delve into court life of 17th century French aristocracy, the period known as Le Grand Si cle- The Grand Century .